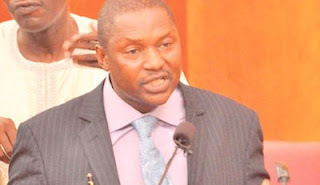 The Attorney General of the Federation (AGF) and Minister of Justice, Mr. Abubakar Malami (SAN), has said there will be no plea bargain for those charged with corruption cases. He also said the federal government had put in place a formidable team of public prosecutors to take on the government’s anti-corruption war at various courts in the country. Malami made the disclosure yesterday when the BringBackOurGirls campaign movement visited him at his office in Abuja. The BringBackOurGirls group, which had championed the call on the Federal Government to secure the release of over 200 Chibok school girls who were abducted from their school in Borno State in April 2014, was at the minister’s office to engage him on securing the girls’ freedom from captivity. The AGF restated President Muhammadu Buhari’s commitment to bring all perpetrators of corrupt practices that led to the heightened insurgency to book. “We have put in place a national prosecution team that comprises all stakeholders for the purpose of prosecuting the charges presented before the courts. “The committee will be saddled with the responsibility of preferring the relevant charges and ensuring that charges are preferred in line with the dictates of the law without compromise,” he said. The nation’s chief law officer noted that corruption cases under past administrations in the country were deliberately compromised during investigation in order to pave the way for criminal suspects to escape the long arm of the law. Malami however assured the group that steps had been taken to audit such cases with a view to bringing the culprits to justice. “It is not just about having a team that will be prosecuting but ensuring that the relevant audit is taken as it relates to previous prosecutions to ensure that those that are found wanting are brought to book, and then the future of prosecution in this country is further enhanced by having in place an effective legal team that will involve legal drafters for efficient drafting of charges. “In addition, there will be efficient investigators that will ensure that adequate proof of evidence that will establish the required ingredients of an offence are put in place, and competent prosecutors that will ensure that the required evidence is presented before the relevant courts for the purpose of establishing guilt,” he said. On the issue of plea bargains as raised by the convener of the group, Mrs. Oby Ezekwesili, the AGF expressed his abhorrence for the policy and pledged the government’s commitment not to compromise the fight against terrorism and financial crimes. “I cannot imagine someone being responsible for monumental deaths of our citizens and then going scot-free arising from a plea bargain as a policy. “It has never been the policy of the government to compromise on terrorism and financial crimes. It will never be tolerated by the office of the AGF,” he said. He described the abduction of the schoolgirls as “tormenting and psychologically traumatisisng” for the nation. “It is tragic for a nation to have a budget meant for arms procurement for the protection of lives and property of the citizens, and ends up not having the arms but compromising the process of making adequate provisions for the protection of lives of its citizens. “The government of President Muhammadu Buhari has demonstrated sufficient skills and commitment to the protection of lives and property within the shortest practicable time of coming into existence, it has recorded tremendous success including confronting terrorists in Sambisa forest head on with the hope of rescuing the Chibok girls,” he stated. The minister reassured the group of the government’s commitment to secure the girls’ freedom from captivity.